Firstly, the acoustic of an ocarina is uniquely pure, and easy on the ear. When played by large groups of total beginners, ocarinas blend well with a quietly pleasing sound. This encourages everyone from the word go. 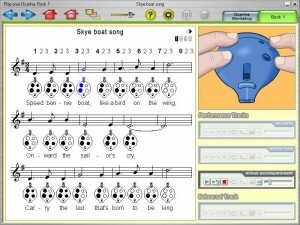 Secondly, any mainstream child can read ocarina music and play from the charts; even those with learning difficulties can succeed in this. Ocarina playing is the ultimate inclusive activity for everyone; the sky’s the limit! Thirdly, all our teaching resources are teacher-friendly and child-friendly so that everyone can be involved in the learning process and music-making. 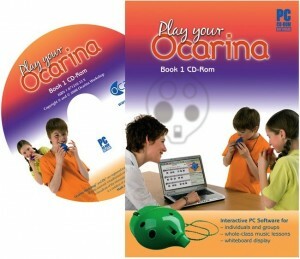 In the introductory video showing ocarinas in schools, older children operate the CD-Rom for the whole school, enabling the head teacher to observe and join in at the back of the hall. The eyes of the whole school follow the animated Oc® and on-screen music, and all play well together as a result. Each stage of learning is outlined in the CD-Rom booklet and in our other teaching resources. 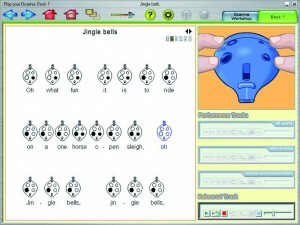 The Software is well designed and really easy to use; great for the most able children and also for those who are just starting out. An exceedingly useful and innovative teaching resource that anyone can access. I was a child of the 1960s. Silent music lessons or just singing were the norm. When I began teaching, I vowed that, just as in PE, every child would be actively involved in every lesson. In music that means playing instruments, listening to each other’s performances, evaluating and composing. In whole-class ocarina lessons, everyone is busy – playing, listening, watching, copying and playing again. Ocarina-playing schools are noted for their children’s purposeful behaviour and rapid progress in music – boys as well as girls – natural musicians and those less able. We know that a sympathetic Headteacher is essential for music to flourish. This doesn’t mean a Head with bottomless pockets diverting funds from other core subjects but a school looking to maximise their own resources and staff to make the most of music. 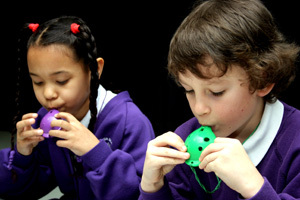 Whether your school music provision is “inadequate or barely satisfactory” or “exceptional” or somewhere between the two, ocarina-playing can form an important part of your in-house provision – affordable, practical and achievable. 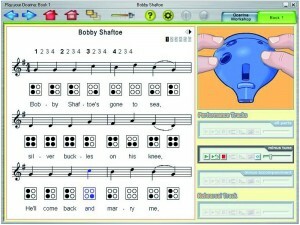 Together, we can make Music in your school: better still, and better!